Tonight I have the Gelicious Precious Metals Collection. 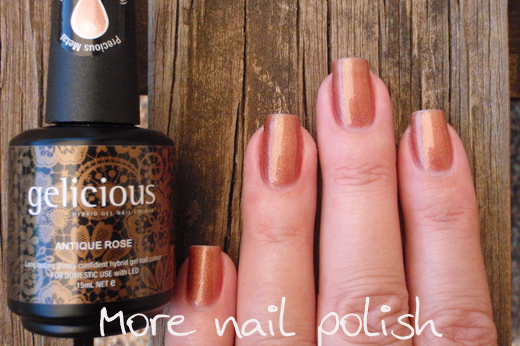 Gelicious is an Aussie hybrid gel polish, aka a soak off gel polish. I've been working on swatching the entire Gelicious colour range, and realised I had not posted any for a while. Of course my timing is terrible given that Gelicious was just on sale through Ozsale and Catch of the Day very recently and swatches of more colours would be very helpful for anyone looking to take up those deals. But the deals come up quite often so I may as well get these out there. 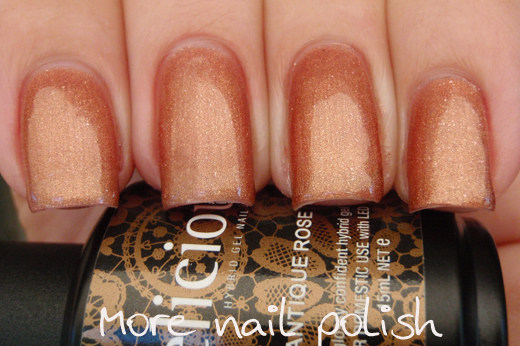 Antique Rose - I was expecting this to be a pink shade, but I'd say it' more of a copper. This shimmer is beautiful and there is no sign of frostiness. This is two coats of Antique Rose with the Ultra Glaze Top coat. 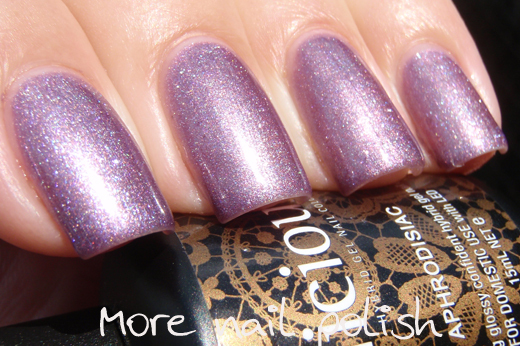 Aphrodisiac - This one is just so pretty. Its a sparkly metallic light purple. 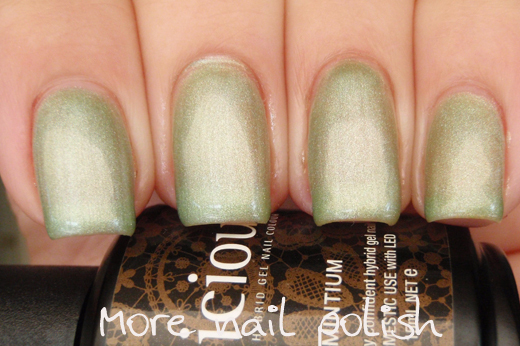 Opacity was good on this one too, and this is two coats with Ultra Glaze top coat. 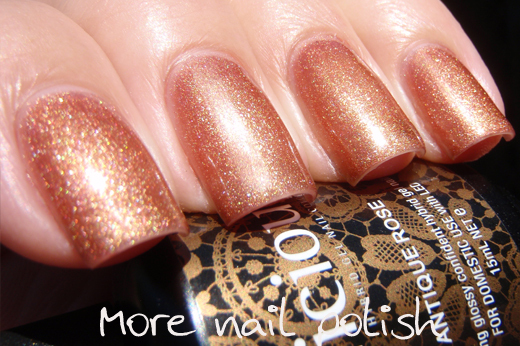 Gold Digger - I've previously shown this colour before in my initial review of Gelicious, because it was my choice of colour when I purchased my Gelicious kit. I still love this colour. 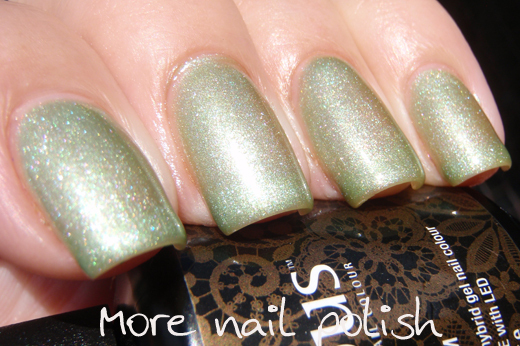 Its metallic and sparkly and a perfect cool toned golden shade. Very flattering and the exact sort of gold I love. This was two coats with Ultra Glaze top coat. 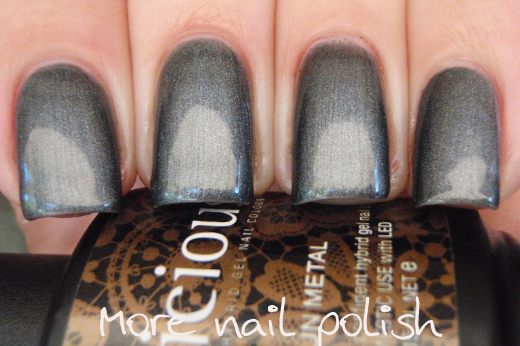 Gun Metal - Another excellent precious meal shade. This is a blue leaning metallic gun metal grey. Two coats with Ultra Glaze top coat. Mintium - a very pale metallic green. Another pretty shade, but this one needs more coats to get it opaque. This was four layers of Mintium with Ultra Glaze top coat. 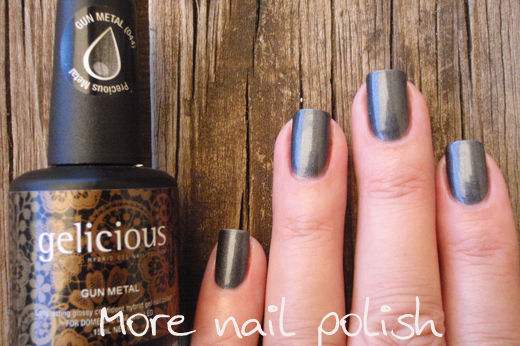 I always apply my coats of Gelicious very thinly, so even at four coat it wasn't too thick. All of these soaked off easily using the foil method of removal. I recycled some Gelicious remover wraps for mine. Only Mintium needed a bit of scraping because there were those extra coats of polish on. Some products provided for review. These look fantastic! How many days do you usually leave this polish on? If I wear a gel base, I like wearing either the clear base colour, or gold digger, and then just layering all my other polish on top and using non acetone remover. I get about a week out of it, but less if I wear glitter bombs, I find they chip the gel a bit and mean I have to remove it earlier. Beautiful! Wish I could get them here in the US as well as the Femme Fatale polishes. I love the colours and have to add that I can get anything up to two weeks of wear. It depends though what I'm doing in that time. If it's working around the house with cleansers or in the garden then my dominant hand gets a bit more wear and so I might only get a week. I just love using other colours over the top or for nail art bases. My top pick though for instant colour changes is with Layla Hologram Effects because the high shine is perfect as a base and they dry so fast. 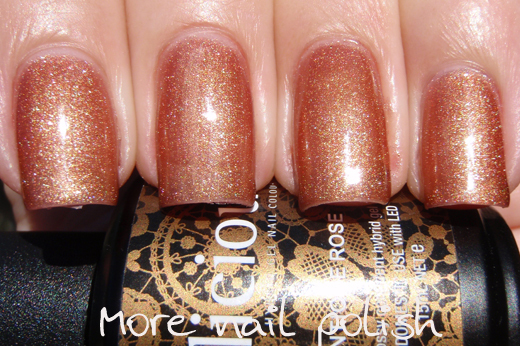 I really like how you post close-ups and then a picture of the polish at a more typical distance away. It helps me know what the polish will look like to me throughout the day!